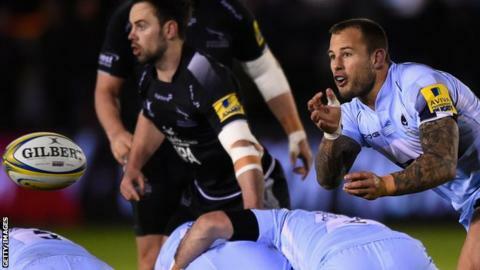 Worcester secured their first Premiership away win in two years and temporarily eased their relegation fears with victory at Newcastle. Andy Goode kicked two penalties for the hosts early on but flanker Dewald Potgieter crossed to give the Warriors a 7-6 lead at the break. Kiwi winger Bryce Heem added a second try as Worcester played with the wind. Falcons prop Rob Vickers crossed on his 200th appearance, but Craig Willis missed the vital conversion. Worcester's last Premiership away victory was also at Kingston Park when they won 17-12 in March 2014 - and this is their first-ever league double over the Falcons. After a 13-game winless run was ended by beating Sale Sharks, Dean Ryan's team have now won two of their last three games to move above Newcastle into 10th and are nine points above bottom-of-the-table London Irish. Newcastle fly-half Goode, who amassed 823 points in three years with the Warriors, was taken off late on and his replacement Willis could not convert Vickers' 72nd-minute try - the first Falcons conversion missed at Kingston Park in 2016. Although Dean Richards' side's six-game winning streak at home came to an end with defeat by Worcester, their losing bonus point leaves them just one point behind the Warriors in 11th. "We just didn't perform and were about 60% efficient in what was a pretty boring game, which is very disappointing. They took their chances and we didn't. "We tried hard in the last 10 minutes but it was a pretty poor game between two sides who looked as if they were both trying to lose the game. "We won by a point against Northampton and we lost by a point this time. It's disappointing that we didn't play to our potential." "I'm just pleased for the lads. They had the courage to go out play for the win. "To come back from that late try and get a result says a lot about this team. "The win is a relief. Let's not talk about momentum. If you win two or three that's momentum. We've broken Newcastle's momentum which is important and it puts the pressure back on them." Newcastle: Hammersley; Tait, Harris, Powell, Watson; Goode, Young; Vickers, Lawson, Vea, Wilson, Robinson, Welch (capt), Latu, Hogg. Replacements: McGuigan, Rogers, Hatakeyama, Botha, Chick, Takulua, Willis, Socino. Worcester: Pennell; Heem, Wynand Olivier, Mills, Vuna; Heathcote, Hougaard; Rapava Ruskin, Bregvadze, Schonert, O'Callaghan, Barry, Dowson, Potgieter, van Velze (capt). Replacements: Annett, Leleimalefaga, Johnston, Sanderson, Betty, Baldwin, Lamb, Symons.